Thank you for being with us in our mission to promote a culture of Honour and Honouring for the well-being of our nation. As we approach National Day, the focus on what are critical for the future of our home and country becomes more salient. This newsletter serves to provide you an update of our past quarter and upcoming activities. The past quarter has been very fruitful and encouraging. We successfully organised the 4th Honour Film Screening that played to an audience of over 650 guests, our largest turnout to date. We continue to engage the business community, educators and schools, and community leaders through forums and dialogue sessions. We share more in depth on these initiatives in the following paragraphs. Films: Honour (Singapore) continues to support projects by student filmmakers at Ngee Ann Polytechnic and young adult filmmakers to produce short films on the many ways we can live out Honour in our ordinary lives. Our films have garnered over 2.9 million cumulative online views. We see momentum and invite you to introduce these emotionally moving films to others. Watch the current films at http://honour.sg/short-films/ or on our Facebook page, www.Facebook.com/HonourOurSingapore. Our 4th film screening was held on 14 July 2017 at the historic Capitol Theatre. The event was jointly organised with Ngee Ann Polytechnic and Mothership.sg as our major partners. We showed a brand new slate of films to an audience of over 650 guests. Mr Tan Chuan-Jin, Minister for Social and Family Development, was the Guest of Honour. We were also privileged to have keynote speaker Mr George Yeo share his thoughts on Honour with us. 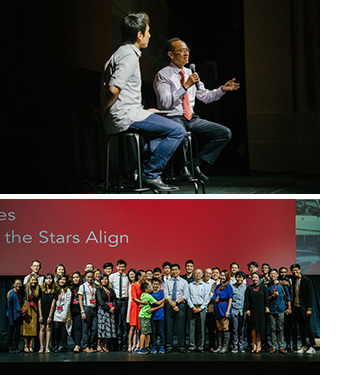 It was an inspiring and memorable evening as we took the time to particularly acknowledge and honour Singapore’s pioneer female Olympians and other heroes who were with us at the film screening. Learning Journey: Following a successful pilot run of our Learning Journey programme in May and October 2016, we hosted two more secondary schools in June 2017. To date, we have reached out to over 2000 students and over 50 educators from ten schools. Through the reflections during the Learning Journey, the students gained a better understanding on what Honour is and how they can live it out in their own lives. We are planning for an Educators’ Forum and Dialogue Session in mid-August 2017. If you are an educator or would like to explore the use of films in values education, please get in touch with us at admin@honour.sg. Thought Leadership: I met with the leaders from Majlis Ugama Islam Singapura (MUIS) on 11 May 2017. I shared the thinking behind our work and learnt more about the work at MUIS. We all agreed to continue to explore synergies and areas for collaboration. I was also invited as a guest facilitator at Fairfield Methodist School’s (Secondary) staff retreat for a workshop entitled ‘The Singapore I Want’. I shared the importance of Honour and Honouring for the continued survival and success of Singapore. It was encouraging to hear from the educators as they described the kind of society they envisage not only for themselves and their students, but also for the generations to come. I also had the privilege of speaking with all the students at Yu Hua Secondary on the importance of Honour and Trustworthiness for their success in work and life. I was surprised by the variety of interesting questions during the Q&A session; it was quite unlike the silence that often filled Q&A sessions in many of my speaking events. Singapore stands in grave danger if Singaporeans do not think for themselves. I applaud the Yu Hua-ians for their interest and willingness to raise questions. Honour Toolkit: The Honour Toolkit is now completed and available to organisations that may find this teaching material beneficial. Many corporations have values, but how many employees actually know and practise those values in their workplaces? The Honour Toolkit is designed to help organisations inject Honour into their own training programmes, so that their employees may honour their word, honour each other, and honour their company values. A sneak peek inside the toolkit is available here. For more information on the Honour Toolkit, please email ToolKit@honour.sg. Honour International Symposium: The Honour International Symposium is a biennial symposium that brings together leaders and future leaders in business, government, and community groups to discuss issues of honour and honouring for successful business, stable homes, and strong nations. Our inaugural symposium was successfully organised in 2016 where we had the privilege of hearing Alibaba’s founder, Mr Jack Ma, share his thoughts on the virtue and criticality of Honour. You can find the video message from him here. To find out more about the symposium or to watch the recorded speeches, visit us at http://honourinternational.sg/videos. Thank you once again for your continued support and belief in our mission of promoting a culture of Honour and Honouring for the well-being of Singapore. And as we celebrate National Day, our wish to all Singaporeans simply is Majulah Singapura, Onward Singapore.